Our websites come equipped with the tools and features to help you close those deals and grow your real estate investing business. Everything is controlled from a virtual back office so simple you can run your business from your website even if you are new to computers. Targeted fresh leads are the lifeline that any business needs to thrive. Our real estate investing websites come fully optimized for search engines targeting your local market – where you do business. This on-site search engine optimization means that we have paid extra attention when creating your website to make sure we follow the latest search engine guidelines so that your website actively generates leads. As a result, the designs and content remain friendly to search engines and attract business for you. Every website needs an extra push to rank well on the search engines. SEO is always ongoing, and we offer ongoing training for you to dominate your local market and generate more leads. Content is king. Google and other search engines LOVE new content. Adding fresh content to your real estate investing website invites favorable placement by search engines. SEO today is more content based than ever before. Our real estate investing websites come integrated with a WordPress blog, with themes to match the existing designs. The blog is fully optimized for search engines. Posting fresh content on your website attracts favorable placement in the search engines. Speaking Models instantly capture attention and compel visitors to take action, such as sign up on your website. A real life-like person speaking on your website adds credibility and believability of your sales message leading to more closed deals. The speaking models deliver a kind, down to earth but powerful message designed to offer a believable solution to the needs of your website visitors in just a few seconds. It takes only 20 seconds to capture the attention of a website visitor, or they leave for ever. Each lead to your website is golden; your website works to convert each one to sign up, or call you. The models are mobile and SEO friendly, and you can choose male of female with a single click. Ebooks offer helpful information to your website visitors – and they can only get the Ebook if they provide their contact information such as their email. Once they sign up, the website will then nurture these leads for you. Check how these Ebooks convert leads for you . Of course the websites come loaded with a variety of squeeze pages through which they can sign up for the Ebooks. 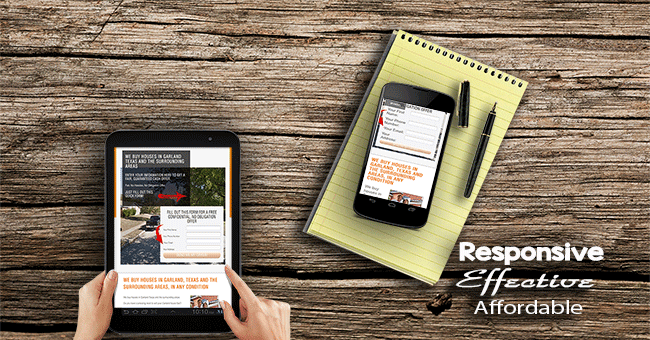 This compels visitors to sign up wherever they are on your website – increasing conversions. Multiple strategic calls to action:- The websites provide multiple opportunities to take the next step – call you or sign up. They then nurture these prospects through in-built, carefully timed automated follow-up email so they warm up to you enough to trust you to do business with you. This involves well-timed, carefully worded follow-up emails. The EBooks and follow-up messages establish your credibility with motivated sellers – and they trust only you to sell their house to. This warms them up so they are willing and ready to close deals with you. Close Deals with you – this is the ultimate goal of any real estate investor. It is the only time you make money. Your website takes you through the journey of attracting leads till you close deals with them. The inbuilt automation with integrated follow-up email marketing nurtures cold leads so they warm up and trust you enough to do business with you. Nurturing leads generates 50% more sales at 33% lower cost. Our websites are built to handle this for you hands-off. In addition, automation of daily tasks makes your work easier and more efficient. 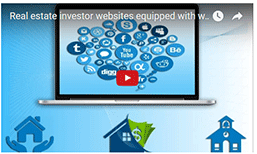 Each real estate investing website comes with in-built unlimited follow-up autoresponders and mailing list capabilities. You do not have to pay for autoresponder services to manage your buyers lists, or any other lists that you manage. Autoresponders give you the ability to send fully personalized messages at pre-set time intervals all hands-off. So your marketing is more effective without spending extra time. When a prospective buyer submits their information, instantly tell them you have received their information and that you’ll contact them as soon as you get a house that fits their needs. Then follow up 2 days later with instructions about how to prepare for their new purchase. On every seller, property, or person, you can log unlimited notes for future reference. Each note can be set into an automated reminder sent on the day of your choice. Say John buys a wholesale property you have for sale (123 Main Street) in a partnership deal. You need to follow up in 3 days to make sure the funds have been wired to the title company to close in time. You can log a reminder note on 123 Main Street so you are reminded at 7 am, 3 days from today. We all get busy – but this does not have to get in our way to closing those deals efficiently… These automated reminders ensure you close those deals – busy schedule or not! Increases the efficiency with which you communicate with leads, follow up with them (automatically) and convert them from cold leads to closed deals. Eliminates missed opportunities associated with forgetting important follow-ups and events. The websites come loaded with numerous, mobile responsive designs. Perfected to convert leads on all devices. Load any design with one click. Delivered loaded with all designs. Integrated with marketing features that engage visitors to take action such as sign up or call you. No matter what business model you adopt, you can adapt your website to suit your business model with just a few clicks from a simple virtual back office. Adaptable to suit any business model whether you buy, sell or wholesale houses, rent them, looking for private money, buy notes, e.t.c., you can customize them usually with a few clicks to do exactly what you want. You can Add/Edit content, pages, custom forms, navigation menu tabs, e.t.c. Of course, each mailing list created through each form comes with full autoresponder automation features and mailing management capabilities. In other words, even though your website is delivered ready for business, you can tweak it to work exactly as you want and be uniquely you. Each website is fully equipped with all features necessary to run your real estate investing business right from your virtual back office. They pre-educate motivated sellers, delivering fully deliver pre-screened and pre-negotiated deals . Of course you can run comparable sales, repair estimates, acceptable offers directly from the virtual back office. When you are selling houses, you can list your properties for sale, rent or wholesale with pictures, video, Google maps, Walk Score, e.t.c. Each website comes fully equipped with features to sell houses fast such as email marketing features . Inbuilt buyers lists for selling or wholesaling houses fast. That is not an error – you buy it once, it’s yours for life. As long as you maintain your hosting account, your website will always be online. If you take a break then come back, just activate your hosting account and get your website online for free. Each website is delivered customized and ready for business within one hour. One-time payment, own it for life – Only pay for yearly hosting at $64.50 a year.